A biorefinery that will produce 16 MMgy of cellulosic ethanol and 120,000 of lignin pellets is set to break ground in Spiritwood, North Dakota, in spring 2019. The facility, under development by New Energy Blue, will feature Inbicon technology. The U.S. EPA has released new data on small refinery hardship waivers confirming the agency has, to date, waived volumes equal to approximately 1.46 billion renewable identification numbers (RINs) for 2017 and 790 million RINs for 2016. Poet Biorefining – Marion opened an 80-million gallon expansion Sept. 19 at a celebration that included area farmers, community members and state officials. The facility now has an annual capacity of 150 MMgy. UNICA, the Brazilian sugarcane industry association, has announced sales of hydrous ethanol set a new bi-weekly record during the second half of August, reaching 1.05 billion liters (277.38 million gallons). 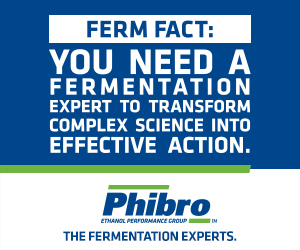 NextFerm, an Israeli company that produces fermentation products for the food and feed industries, is venturing into the ethanol industry by partnering with Mascoma, a subsidiary of Lallemand, a leading supplier of yeast to ethanol producers. Following news reports that Green Plains Inc. is idling two Iowa ethanol plants, the company has confirmed that its Superior, Iowa, plant has temporarily ceased production but stressed that it flexes production at its facilities on a regular basis. NAES Corp. has been selected by BioMass Solution LLC to operate and maintain Red River Biorefinery in Grand Forks, North Dakota. The facility is designed to produce 16.5 MMgy of ethanol from sugar beet tailings, potato wastes and other byproducts. Reps. Kristi Noem, R-S.D., and Collin Peterson, D-Minn., leaders of the bipartisan Biofuels Caucus, led more than 20 House members in sending a letter to the U.S. EPA urging the agency to approve year-round E15. Southwest Iowa Renewable Energy LLC and Whitefox Technologies have reached an agreement to install a Whitefox ICE advanced membrane dehydration system at the SIRE plant in Council Bluffs, Iowa. Growth Energy, the U.S. Grains Council, and the Renewable Fuels Association jointly submitted comments to the United Kingdom's Department of Transport as it considers implementing a nationwide E10 ethanol blend.